I am about to start building a small table around a whiskey barrel head (see photo) and I am trying to figure out what finish I will need to use at the end. The barrel head is unfinished and had presumably been sitting in a warehouse for years prior to the barrel being disassembled and parted out. 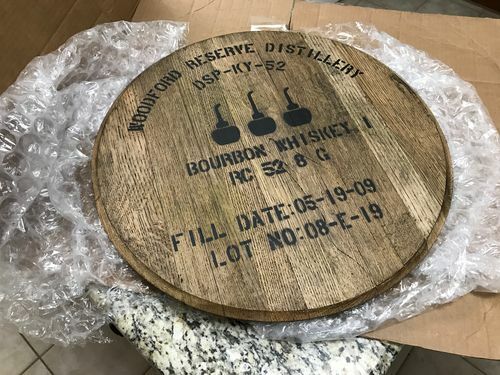 I want to keep the distillery logo (one of my favorite bourbon makers…), so I don’t want to sand or use any harsh cleaners that would take the paint in the logo/writing up. I just bought an HVLP sprayer and would love to be able to spray a water-based top coat (I’ve been using General Finishes) on it to get the best finish, if possible. Is there any reason not to use a water-based top coat for this? Also, I will be building the base from new white oak and was wondering if anyone had any suggestions on a method that I could use to match the coloration of the oak in the barrel head. I think matching the patina on the barrel head would be pretty difficult to achieve an exact on new wood. Does it appear to have an existing finish on it now? Hard to say without looking at it looks like an oil finish(tung, linseed,ect). My suggestion would be to either paint the base black and topcoat to the appropriate sheen or you could try to get a similar color of stain and try to slightly tint your topcoat and spray after staining. Start lighter than you think you need to be and gradually go darker. I would paint it black if it was me, GF has some great milk paints that look amazing. GoodLuck! Let me know how it turns out!